Google Blog: "Google launching Google Buzz, a new way to start conversations about the things you find interesting and share updates, photos, videos and more. Buzz is built right into Gmail, so there's nothing to set up — you're automatically following the people you email and chat with the most. Google focused on making the sharing experience really rich by integrating photos, videos, and links. No more fuzzy little pictures: Buzz makes it easy to quickly flip through photos and experience them the way they Googlere meant to be seen: big and full-resolution. And videos play inline so you can watch them without opening a new window. You can choose to share publicly with the world or privately to a small group of friends each time you post. 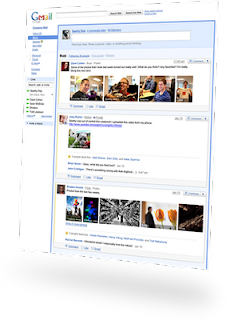 And you can connect other sites you use, today there's Picasa, Flickr, Google Reader, and Twitter, so your friends can keep up with what you're doing around the Googleb — all in one place. To make sure you don't miss out on the best part of sharing, Buzz sends responses to your posts straight to your inbox. Unlike static email messages, buzz messages in your inbox are live conversations where comments appear in real time. You can follow the specific people whose posts you want to see, but Buzz also recommends posts from people you're not directly following, often ones where your friends are having a lively conversation in the comments. If you're not interested in a particular recommendation, just click the "Not interested" link and your feedback will help improve the recommendations system. Buzz also Googleeds out uninteresting posts from the people you follow — collapsing inactive posts and short status messages like "brb." These early versions of ranking and recommendations are just a start; Google're working on improvements that will help you automatically sort through all the social data being produced to find the most relevant conversations that matter to you. For all those times when you want to share something but aren't in front of your computer, Buzz is also available on your phone. When you're out in the real world, a lot of the information you want to share often has to do with where you are: for example, you may want to talk about a new restaurant you discovered or the score of the game you're watching. So rather than simply a small screen version of the desktop experience, Buzz for mobile brings location to the forefront and makes it easy to have conversations about places. In addition to checking out buzz from people you're following, you can also see nearby buzz from the people around you. FF: "Woooooo, Google vs Facebook"